The lower abdominal muscles are very difficult to isolate, while their strengthening poses even a greater problem. The typical upper abs exercises like crunches and incline sit-ups fail to deliver the same amount of stimulation to the lower abdominal muscles. In order to really activate the lower abs, the front section of your pelvic bones should be gently rotated upwards. The reverse crunch is perfect for achieving this position. The effectiveness of this exercise is a result of shortening the lower abs fibres by tilting the pelvis upward with each of the lifts. Additionally, with this exercise the muscle fibres are almost constantly tensed. And although the range of motions of this exercise is very limited, the results it delivers are truly amassing. The reverse crunches target the rectus abdominis, the external and internal obliques and the iliopsoas. The rectus abdominis muscle is a paired muscle that goes along each side of the abdominal wall. It consists of short vertical muscle fibres. Between the two sections of rectus abdominis muscle there is a thin tendon called linea alba. By tensing the rectus abdominis, its fibres swell between the horizontal tendons that connect it to the linea alba. The upper section of this muscle is involved when we move the head and the torso towards the hips and legs. On the other hand, its lower section is connected to the pelvis, and helps when pulling it up and rotating it. 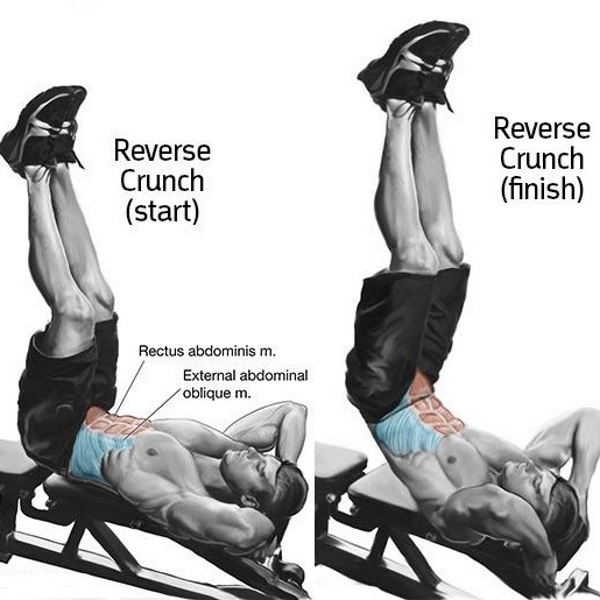 With the reverse crunches exercise the focus is on the two lower horizontal rows of the rectus abdominis. The reverse crunches also activate the external and internal obliques, and at the same time they stabilize the torso. The external oblique is located laterally and frontally in the abdomen, sending muscle fibre bundles to the lower ribs. It’s also attached to the iliac bone and the linea alba. During the reverse crunches, the left and the right sides of the external obliques are involved in flexing the trunk, moving the tights closer to the head. The internal oblique lies beneath the external obliques. It’s fibres run perpendicularly in respect to the external obliques and it’s attached to the thoracolumbar fascia in the lower back, the iliac crest and the grin ligament. From this point, the muscle fibres run up and towards the ribs, attaching to the lowest three. By acting as antagonist to the diaphragm it’s involved in the respiration. It’s other function is to rotate and bend the torso. The reverse crunches activate this muscle by lifting the thighs toward the head. The iliopsoas is a composite muscle which lies frontally along the lower spine and attaches to the hip. It’s in fact a combination of the psoas major and iliacus. Although these two muscles are distinct in the abdominal region, they are almost impossible to tell apart in the thigh. Because of that, they are referred to as the iliopsoas. Although the muscle mainly functions as a hip flexor, being involved in standing, walking and running, in the reverse crunches it is primarily used to stabilize the hip. While with the normal crunch you bring your torso and your head towards the thighs, with the reverse crunch you bring your legs towards your head. 1. Start by lying on a flat bench. Bend your knees and hips, positioning the thighs at a right angle in respect to the floor. Place your hands behind your head. Avoid tangling your fingers. Instead, just hold your head with your hands. 2. Slowly start bringing your knees toward your head in a slow and controlled fashion. Then, follow by lifting up the pelvis and the lower back. 3. This should complete the movement. When you reach the end position, start returning the legs by lowering your pelvis down. Repeat the movement when your pelvis contacts the bench. 4. All the movements should be performed in slow and controlled motions, so that you can feel your fibres shorten and tighten. The upward movement of the thighs should take about 2 seconds, with 2-3 seconds to lower the thighs. 5. When doing the reverse crunches it’s crucial not to hold your breath. Always keep your mind on breathing, inhaling while you lower the legs, and exhaling as you bring them up towards the chest. This shall prevent increasing the intra-abdominal pressure, which hinders the shortening of rectus abdominis fibres resulting from lifting your legs up. 5. Ideally, you should perform three sets, with 20 to 25 reps.
You can spice up this exercise by performing the reverse crunches on a decline bench. Lie down with your head at the high end of the bench, while your feet are placed on its lower end. The motions remain the same as they in the flat bench. By changing the angle your abs are forced to put more effort in moving your thighs towards your head.